Many of the boats Stanley Boats build start at 24 feet and go up to more than 40 feet, Coupar said, adding that the larger boats are typically dedicated to fire suppression, although some have multi-purpose missions. Coupar said that the increased frequency of bad weather, including hurricanes and lots of flooding on the eastern seaboard of the United States, has forced many departments to consider adding some sort of boat to their arsenals. “Demand for rescue boats is like we’ve never seen before,” Coupar said, adding that weather changes have caused flooding and water emergencies in areas that had previously been unaffected. That has left many departments scrambling to purchase rescue boats. Often departments are left to their own devices in times of water emergencies, Coupar said. State and federal agencies are swamped and they can’t provide assets as readily or as rapidly as they once did because of increased demands. The demand was greatest for boats that could navigate shallow, debris-filled water, Coupar said. The extreme weather has caused nearly all responders along waterways to look at their marine responses to figure out “what they can and cannot do,” Coupar said. Coupar said the American waterway system is complex and interconnected from the Great Lakes to the Mississippi River to the Gulf of Mexico. Water can quickly overwhelm a geographic area and, with nowhere to drain, flooding can go on for weeks, Coupar said, leaving communities with boats as the only means of access to flooded areas. Stanley Boats makes aluminum vessels with modified V-bottoms that flatten out, Coupar said, allowing them to navigate the shallowest of water safely, and navigate deeper waters as well. Coupar said Stanley Boats are aluminum, so they are lightweight and can be transported easily by trailer if needed. Most are powered by outboard motors, but the company also has jet-powered boats available, which are well-suited for extremely shallow waters. Coupar said once an agency has determined they have a need for a boat, the officers and users have to determine the fundamental needs. “Every department will have its own ideas on how to approach the purchase, but all the officers and everybody have to be clear about the mission,” Coupar said. Lightweight, purpose-built boats can be towed to the nearest launch point and go to work almost immediately, Coupar said. They represent a “very modest acquisition” for most departments and training is readily available and the boats can be staffed as needed, he added. Larger boats, up to 30 feet and more, need dedicated staff, usually 6 to 12 people, so agencies have to think about those commitments of resources and how it will affect the mission, Coupar said. Coupar also suggested that departments and emergency response agencies should work with neighboring departments to develop mutual-aid agreements and response plans as they consider what kind of boat to purchase. Neighboring communities might have very similar needs and waterways, Coupar said. “You should look beyond your jurisdiction,” Coupar said. “Look at projected flooding for your area and your state.” He said the National Oceanic and Atmospheric Administration (NOAA) has highly accurate maps that are updated frequently. Those maps offer a good bases from which to build a response plan and to determine the number of marine resources needed. It’s important to determine how each marine asset fits into the region and the jurisdiction, Coupar said. “Sometimes, people just need to step into a boat to escape from whatever is coming and that’s all that’s needed,” Coupar said. And, sometimes, much more is required and boats become the only means to provide life-saving services and fire protection. There are some departments that want boats to do everything, Coupar said. 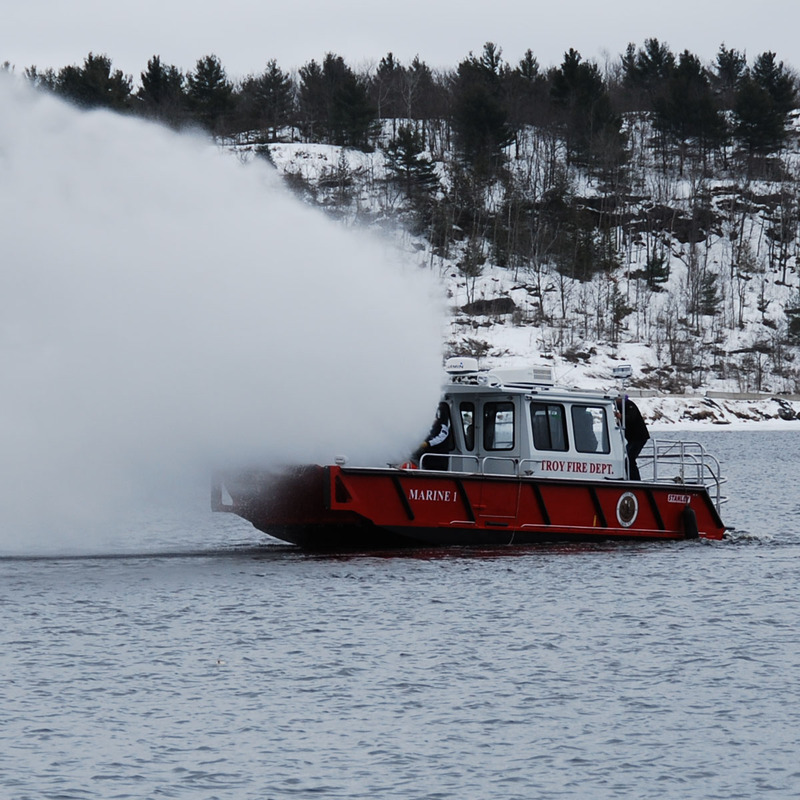 They want fire suppression capabilities and Stanley Boats offers pumps from all the manufacturers in sizes from 500 gpm to the most popular size of 1,500 gpm. Some departments want space for PPE, SCBA bottle racks and some want medical equipment and oxygen, Coupar said, adding that boats with foam capabilities have also become popular.